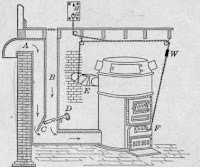 Hot-air furnaces are self-contained and self-enclosed units. They are usually centrally located within a building or house. Their purpose is to make sure the temperature of the interior of the structure is maintained at a comfortable level throughout. lighter, which causes it to rise. The warmer, lighter air continues to rise until it is either discharged directly into a room, as in the pipeless gravity system, or is carried through a duct system to warm-air outlets located at some distance from the furnace. After the hot air loses its heat, it becomes cooler and heavier. Its increased weight causes it to fall back to the furnace, where it is reheated and repeats the cycle. 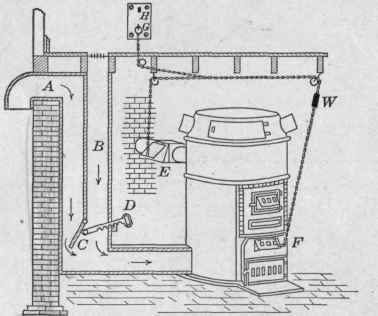 This is a very simplified description of the operating principles involved in hot-air heating and it is especially typical of those involved in gravity heating systems. The forced-air system relies on a blower to make sure the air is delivered to its intended location. The blower also causes the return air to move back to the furnace faster than with the gravity system. With the addition of a blower to the system, there must be some way of turning the blower on when needed to move the air and to turn it off when the room has reached the desired temperature. Thus, electrical controls are needed to control the blower action.